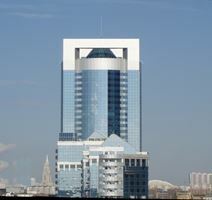 The centre is located in an exclusive and highly business-oriented area of central Moscow, renowned for its excellent corporate reputation due to its high-profile business residents. Amenities include high speed internet, on-site management, flexible terms and an abundance of natural light to enhance focus and productivity within a well-designed, efficient space. With 24 hour access, your business can operate around the clock. The Avrora Business Park overlooks the Garden Ring Avenue and offers excellent transport links. A remarkable selection of offices are available to let in a prestigious building, modernly designed with great attention to details. Located in proximity of Moscow city centre, these offices enjoy a very convenient location in a dynamic area, which hosts companies and organizations. Within walking distance of the station, these offices are well served by public transport and easily accessible by car. 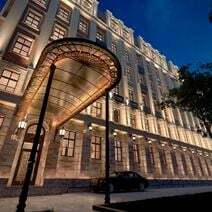 Just a 10-minute walk from The Kremlin, this premium class building is situated in the heart of the Presnenskiy district in Moscow. The contemporary space has an abundance of amenities, including an on-site car park, friendly staff, a professional video surveillance system and a modern access control and warning system. There is a modern cafe on the ground floor of the center which serves customers 24/7. This is the ideal workspace solution for innovative companies that would like a functional space in which their business can flourish. 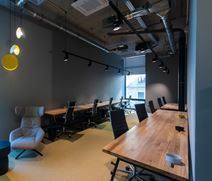 Part of one of the biggest co-working projects in Moscow this work space is ideal for entrepreneurs, start-ups, small companies and big corporations alike. A range of open-spaces, meeting-rooms, kitchens and café. This highly accessible site can be found close by the Bittsevskiy Park. Opening its doors soon in the heart of Moscow, this modern building is set to provide a great range of office solutions including private offices and co-working options. As a member you can easily access communal areas and benefit from a range of amenities such as complimentary refreshments, cleaning services and high speed internet access. This space is more than a comfortable and productive workplace, it allows you to become a part of a great business network. With flexible occupancy terms and fully furnished interiors, this centre is ideal to base corporate operations in a high-prestige business environment dominated by large, mainly blue-chip companies. The centre is situated in a prominent business-focused area of Moscow, just off Ulitsa Zemlyanoy Val main street and offers workspace within a thriving and contemporary corporate environment. Networking opportunities are extensive due to the diverse range of local services operating in the area. This remarkable business centre is positioned on the fourth floor of the 17-storey property, and includes high ceilings, 24-hour security and access control, as well as well designed meeting rooms. This business centre is just 2 km from the Third transport Ring, and is within walking distance of many public transport connections. It is highly accessible to an abundance of local amenities, such as fine restaurants, bars, museums and shops. Embankment Tower is situated in the heart of the new Moscow International Business Centre; with breathtaking views of the city's major business district, stunning skyscrapers and the Moskva River. 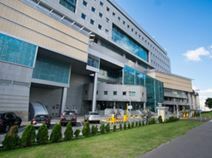 This modern and striking centre consists of three stunning skyscraper structures, with state-of-the-art facilities, such as high speed internet, conference facilities, private meeting rooms, and professional lounge space. Transport links in the area are excellent, with the centre being highly accessible by road via the main Third Ring Road. Situated at the Moscow Ring Road, this Greenwood business park location provides fully furnished and equipped office space. Shuttle buses to the metro station and city buses connect you to central Moscow while the business park itself is a project of a Chinese development company, and home to many Chinese companies running their business in Russia. The space is accessible 24/7, with meeting rooms, business lounge access and other cutting-edge facilities. 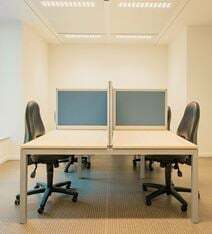 This is an excellent space for growing companies with the opportunity to start small and add more workstations as you need them. 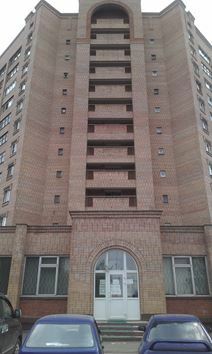 This location provides quick connection with central Moscow and with the residential districts in the northwestern parts of the city. It is only 20-minutes drive to Sheremetyevo airport, and 10-minutes to Belorussky train station and Tverskaya street. There is an on-site management team who handle everything from mail and telephone answering by the friendly reception team as well as cleaning and building maintenance. There is also a communal kitchen where you can prepare your lunch or get your caffeine fix with unlimited tea and coffee. This centre is accessible 24 hours a day, so is well suited for any kind of business hours. The building comes with floor to ceiling windows, creating a fantastic working environment with an abundance of natural light to enhance focus and productivity. The offices come fully furnished, as turnkey solutions for you to set up your business's new home with ease. This location is perfect for companies who value convenience and accessibility- with many quality shops in walking distance to explore outside of work. This business centre is located in the heart of Moscow, and offers fully-equipped executive mini-offices with panoramic views, meeting rooms and conference halls which can seat from 30-150 people. In this location you also have convenient access to Sheremetyevo Airport meaning you can get to the airport in just 30-minutes in a comfortable Aero-express without traffic jams. Within close proximity, you will find a huge number of restaurants and cafes. This building offers a working space, provided with a full range of services and facilities: lounge area, secure parking facilities, 24/7 CCTV monitoring. The centre is located in one of the principal squares of the Moscow, within easy reach of the city centre, the Kremlin, the Red Square and the main sites in the city. The Building is surrounded by restaurants, bars, shops and is well served by public transport. This stylish centre is well situated in central Moscow and features offices to suit everyone, with an abundance of natural light and an array of useful amenities such as; meeting rooms, high-speed internet, business lounges, secure parking, reception desk and a fully equipped kitchen area. Additionally, the centre is well connected through public transport links with underground stations and train stations both within short walking distances. The Airport is also accessible allowing your business to maintain global relationships. Local amenities are numerous and surround the office building, meaning there is no need to venture far to find lunch or activities. Situated in a central district of Moscow, this business centre is just a five-minute walk from Leningradsky train station and its high-speed train links to St Petersburg. The modern, serviced office space is also close to the headquarters of many Russian companies, banks, and other forward-thinking companies with which you can network. At this centre, your company can take advantage of mail-handling services, administrative support and more. 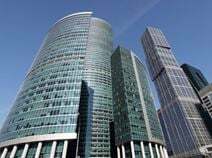 This landmark centre is a prestigious and renowned business centre in of the most thriving and rapidly expanding corporate districts in all of Moscow. The site provides high quality furnished offices available on a flexible basis and complete with a fully functional range of professional facilities on site. The building is situated in close proximity to a number of shops, restaurants and other amenities. This building is ideally located close to railway stations, restaurants, banks ad more. These are newly refurbished office spaces in the heart of Moscow. Offering state-of-the-art business accommodation, this centre is located on the 19th floor of a prestigious and well known building. Built for excellence, here you can benefit from a number of facilities, including IT support, conference facilitiess, copy and printing, and 24 hour access/security. Offering stylish and modern office spaces in the heart of the Basmanny district in Moscow, this stunning business centre has a great selection of bespoke memberships with modern and spacious offices. You can access meeting rooms and event spaces which are perfect for business meetings and large scale events. With 24 hour access you can work at your own pace and your commute is made easy with public transport links right on your doorstep. Situated just outside of Moscow City, this workspace offers all inclusive pricing, with amenities such as WiFi, meeting rooms, kitchen with refreshments, and lounge space along with unlimited printing. For your convenience, there are open-plan offices in addition to well designed offices that also come fully furnished with IT support. There is also a secure car park on site, so commuting to work is painless. This contemporary centre is set in a thriving corporate district in central Moscow, within close proximity to a number of local amenities including shops, restaurants and accommodation. The centre itself provides premium, high quality workspace with both private suites and co-working options on offer. The building is fully furnished and benefits from excellent regional transport links in the immediate area. This space enjoys a prime location close to many public transport links, making it easy to reach from any point of the city. It stands close to luxury hotels and boutiques, as well as many event spaces and eateries. Offering work space solutions for many well known corporations, this centre provides a comfortable and efficient business environment with company signage options, 24 hour access and security, open-plan offices and a friendly, multilingual support staff. The rent already includes utility bills, 24-hour security, cleaning for your convenience. As you will be available meeting rooms, sofa areas, phone booths, kitchen with refreshments and lounge space, you will be well equipped with spaces in which you can network and collaborate with like-minded coworkers. Within the immediate vicinity, you can find an abundance of great cafes, lively bars and excellent restaurants in which you can relax and enjoy, or entertain and impress clients. 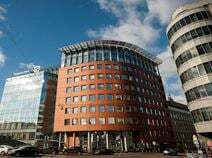 Centrally located in the new business district of Moscow, in the heart of the city, this centre is situated next to headquarters of leading companies and overlooks the Garden Ring Avenue. The centre consists of office spaces, meeting rooms, a lounge area, a cybercafé, parking facilities and 24/7 access. It is close to the railway and the underground station and is connected to the international airport by a high speed train. Perfectly located in the heart of Moscow, this modern and prestigious building is surrounded by hotels, shopping malls, a fitness centres, pubs and restaurants. It offers working spaces provided with a wide range of facilities, including lounge area, secure parking facilities and 24/7 CCTV monitoring. The building offers easy access to the major highways and is well served by railway and underground. A large and bright office space is available for renting in a stunning building, which includes a first class meeting and conference centre, parking facilities, numerous restaurants, cafés, banks and a gym with swimming pool. This professional working environment is situated at the Third Transportation Ring, 5km away from the Garden Ring and 15Km away from the MKAD, in a strategic and easily accessible location. Here, you can enjoy high-speed Wi-Fi, 24-hour access, multilingual support staff, beverages and cutting edge facilities throughout. This impressive building enjoys a strategic location, close to the Kremlin, the most luxurious hotels, famous restaurants and shops. The offices are provided with professional and multilingual support staff and with high standard services tailored to clients' needs. The centre is easily accessible by car and underground, making commutes as simple as possible from any point of the city. This impressive business centre offers modern and stylish offices, furnished and decorated to a high standard. The offices benefit from a full range of services and facilities: reception and telephone answering services, spectrum of outsourced legal services, full accounting and HR, production certification, meeting and conference rooms and parking facilities. Situated in a key location, this centre is well served by public transport and surrounded by restaurants, cafés, banks and shops. Located just within a walking distance of the Kremlin and the Lenin Mausoleum, this business centre is found in the well-know Tverskoy district which has plenty of amenities on offer. The neighbourhood is popular for culture, history and entertainment. The centre offers a range of flexible work solutions, with a community-focused atmosphere where you can grow alongside entrepreneurs and receive support for your start-up. The centre also boasts an impressive conference room and two meeting rooms. Located on the main street of the area, the centre benefits from great public transport links with easy access to the rest of the city and the airport. Offering floors of beautiful, modern and spacious office solutions, this business centre is located in a convenient and premium area. Whether you are looking for a single desk or a private office for your team, this centre meets all your personal and business needs. You can access meeting rooms and event spaces, as well as receiving support from a friendly on-site admin team. With a transparent and all-inclusive fee structure you are not caught out by unwanted fees at the end of the month. An impressive business hub situated in South Western Moscow, providing a range of furnished offices available to let on flexible terms. Here, tenants can make use of the high-speed internet connection, spacious meeting rooms and dedicated reception service. Additionally, the centre is accesible 24-hours a day, allowing tenants to choose hours that suit individual needs. Transport links from this prestigious address are numerous, allowing tenants to access the city-centre and wider regions with ease. This furnished, fully equipped turnkey solution offers an accommodating working atmosphere to every tenant. With both private and co-working options available, companies of any size can occupy this space. There is shared internet provided, as well as meeting rooms, informal lounge areas and a fully fitted kitchen. Furthermore, you can benefit from a secretarial team with telephone answering and mail handling services. The building itself is a eye-catching, landmark structure with its exterior frontage designed to feature multiple colours and materials, which in turn provides a large amount of natural light to the rooms inside the centre. The site also offers high speed internet, conference facilities, a reception area and an on-site management team; as well as 24-hour access to allow clients the flexibility to work whenever is most appropriate for their own personal schedule. Set in an historical building, in one of the most eminent business addresses in Moscow, this business centre has been recently renewed and decorated in Art Nouveau style. The building offers several offices, meeting rooms, touchdown areas in the business lounge, all equipped with high level audio-visual technology. It is provided with professional and multilingual support staff, 24/7 security, parking facilities and on-site restaurant. 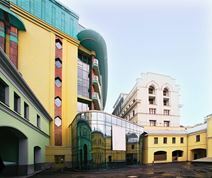 The building is centrally located in Moscow, in front of the National Library, within walking distance of the Kremlin. This cutting-edge, brand new building is equipped with the latest technology systems, located in a business and cultural area of Moscow which hosts fashion shops and a first-class fitness centre provided with swimming pool and spa. The building is set on an important motorway and is easily accessible by underground and railway, which is connected to the airport by high speed trains. Here, you can enjoy a fitness centre, spa, support services, 24-hour access, videoconferencing facilities and more. Finely situated 18km outside of Moscow this independent business centre provides modern serviced office space and facilities that is close to the main train station. Here, you can access the centre 24/7, with round the clock security, allowing you to work through late hours with peace of mind. There is also administrative support, IT support and conference facilities for you to use at your disposal. The offices are accessible 24 hours a day, 7 days a week making it a great working environment if you don’t work the normal 9-5. This space offers all-inclusive rates, with amenities such as Wi-Fi, meeting rooms, kitchen with water, tea, coffee, as well as lounge space and printer areas. Breakfast is also included in the rental price! In walking distance you’ll find 2 Metro Stations Dmitrovskaya and Savelovskaya.